Display manufacturers and viewer expectation help drive the different technological trends and broadcasters / media organisations need to establish the most effective and most economical way of delivering what the viewer wants. Most of the recent drive has been for the enhanced viewing experience provided by 4K, high dynamic range and wide colour gamut and behind this is the desire by organisations to embrace an all IP infrastructure. There are risks, gains and significant investment required if moving to new technologies as opposed to staying with the traditional technologies that many are familiar with. On the other side of the argument, businesses may become more efficient and profitable if adopting newer ones. Broadcasters and media organisations need to tread the fine line between being viable and profitable today with being viable and profitable in the future regardless of the decisions that have been made in the past and those that will be in the future. Within the industry, manufacturers drive change to sell their own products and solutions. Some of these products and solutions help drive progress in the industry and some of these are the results of failings in agreed or desired practice. Instead of manufacturer consortiums and alliances, many in the industry advocate discussions between equipment manufacturers, broadcasters, post house and others in video and vision so that informed choices can be made for the betterment of the industry. Only at this point can all manufacturers offer solutions to help support these decisions. Purchasers of T&M products need to look at the current functionality/compatibility of the products on offer, the approach taken by the product manufacturer to changes in technology, their road map for the future as well as their track record. The development of the Ultra family of products was born out of the needs identified while talking to broadcasters and media organisations and this has culminated in test and measurement products that have been designed specifically to meet their needs today without compromising their future choices. Omnitek does not believe that customers should be penalised for the decisions they may have made in good faith in the past and operates a flexible upgrade process to accommodate changing industry needs and workflows and allow customers to migrate the functionality of their existing Ultra product to any other variant available now or in the future. This allows customers to purchase T&M equipment now, knowing that their investment will not be wasted in the future when further technological challenges arise. To formalize Omnitek’s flexible upgrade path, it will be launching the “Ultra Passport” care package to support its loyal past and current customers. The Ultra 4K Tool Box, launched in 2015, has become the industry standard Test & Measurement tool for manufacturers working with 4K, 12G-SDI, quad 3G-SDI as well as 6G-SDI, HD-SDI and SD-SDI. The Ultra 4K Tool Box provides a sophisticated package of physical layer analysis instruments that are normally only found on high-end, high cost oscilloscopes. With over 500 Ultra 4K Tool Boxes in daily service with manufacturers around the world, we can confidently say that the desire for the early demise of the humble BNC is not the majority opinion. The Ultra XR, launched in 2016, has become the weapon of choice in Post for anyone wanting to grade and quality control HD, SDR, 4K and HDR content. The Ultra XR provides all the traditional tools needed to work with DI - high-resolution waveform display, vectorscope, CIE chart etc - but engineered specifically with 4K/UHD in mind. The Ultra XR supports 12-bit 4:4:4 / 4:2:2 SDI input formats in YCbCr and RGB, along with Wide Colour Gamut RGB - ITU-R BT.2020 and High Dynamic Range (HDR) inputs - ST2084 / PQ and Hybrid Log Gamma. Now with support for SMPTE 2110 / SMPTE 2022-6 HD video with full dual PTP support including packet status monitoring and logging, with 2110 4K support being demonstrated at IBC. The Ultra TQ, launched in 2017, supports the analysis of video over SDI or an IP link as a SMPTE 2110 / SMPTE 2022-6. 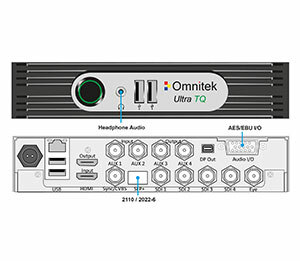 In addition to its comprehensive set of video instruments, the Ultra TQ has now gained the ability to analyse and decode Dolby E, Dolby D and Dolby D+ audio for monitoring and quality checking. This ‘all in one’ solution is proving very popular with broadcasters who are looking to find a solution for current needs with a ‘foot in the door’ for future requirements such as 4K. To allow the decoding of Dolby, AES/EBU input/output as well as analogue audio monitoring functionality, a new mezzanine board has been designed for the Ultra product range. This board provides the AES/EBU audio connectivity required to monitor the de-embedded audio from the SDI/IP stream and decoded Dolby content. This new audio hardware will be available as a factory upgrade to existing customers. The Omnitek team will be available at IBC to discuss its solutions for R&D / Manufacturing, Post and Broadcast. Come and see us at IBC 2018 - Stand 10.A24.